March 23 2015 is indeed a special day for us. Today marks our founder, Lovelynne’s birthday and at the same time, our country Singapore mourns the loss of a great leader, Mr Lee Kuan Yew. 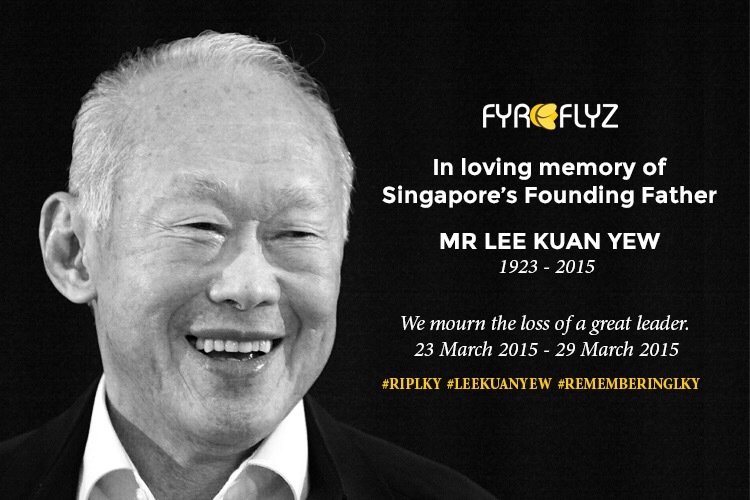 We, at Fyreflyz, citizens of Singapore, are saddened by his departure. And this is our tribute: from the little SME of Singapore. Politics in our little country has always been intensed. And as generations grow older, the country has matured in more than one way. Small in size, Singapore had little means to develop and protect itself. Yet, this one great leader united Singapore’s people- from all races and religions to stand as one. We are all from the newer generation. Our growing up years were filled with progress from MRT to ERP. Traveling to work and school has evolved over the years and we now move forward enjoying the fruits of our earlier generations’ labor. As we spur on, as Singaporeans, we will work towards contributing to our home. Our country. And March 23 will always be a special day for us. A day we are constantly reminded that greatness can come from anywhere as long as we are determined. Thank you Mr Lee Kuan Yew for making this possible. Your work will always be an inspiration to us.